A roaring success for boiling water! They are really designed for camping and outdoor pursuits, but we use ours at home every day… usually on the back doorstep. 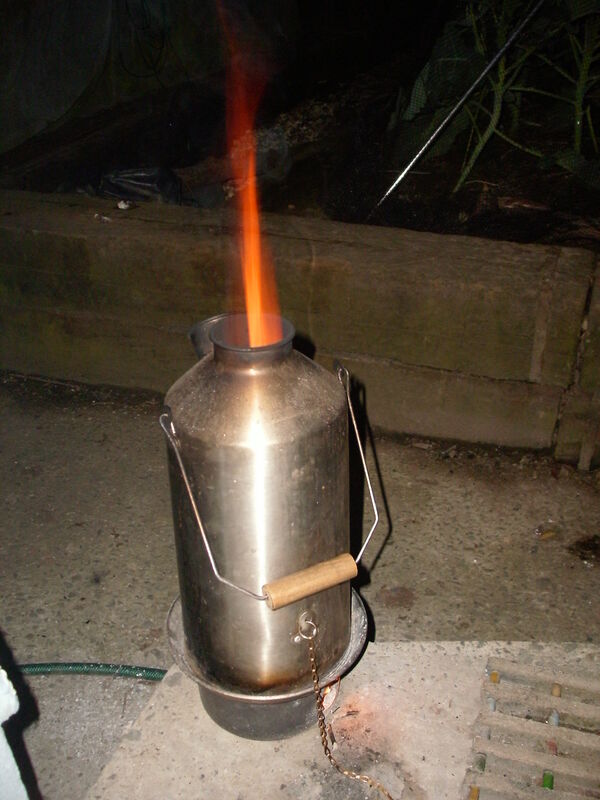 We sometimes light it in the greenhouse if it’s raining or very windy, but that’s for our comfort, the Kelly Kettle will work outdoors in really unpleasant conditions. We fuel it with waste paper, trimmings from around the garden (especially the willow hedge) and sticks that we collect whilst walking the dogs. We boil it a couple of times each day and store any excess hot water in two very good Thermos flasks for later use. We have been doing this for four years now… I’m not sure how much electricity and money it has saved us, but if we assume that it gets boiled 600 times a year and that it saves us £0.05 each time, it has more than paid for itself and we’re well into profit. I suppose that most Kelly Kettles only get used occasionally, so ours has had quite a hard life. Even so, we were very distressed a week or two ago to notice that it was leaking from one of its rivets. I’ve mentioned before how much I hate replacing things and much prefer to repair them (see this post if you want an example) so we started discussing what we could do. 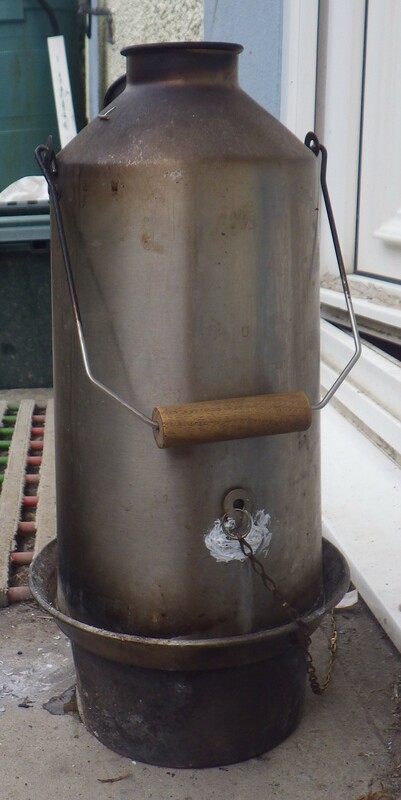 Our Kelly Kettle is stainless steel (we have very soft water here in west Wales, so aluminium was out of the question for everyday use) and neither of us had any idea about how this is best repaired. An internet search was in order… resulting in a link to the manufacturer’s own web site, telling us exactly what to do . Now there’s a company that I have respect for: a company who don’t want you to throw their product away and buy a new one, but who want to tell you how to make it last as long as possible. As a result we have a fully functional Kelly Kettle once more – repaired with food-grade silicone sealant – and a very warm feeling about The Kelly Kettle Company of Newtown Cloghans, Knockmore, Ballina, County Mayo Ireland. Do you know of other companies who behave like this? Because if you do, they too deserve some credit. It’s good to know they’re repairable. Ours also gets daily use, so I imagine that some time in the future we’ll be in a similar need of a solution. We’ve just acquired giant one which I’m looking forward to testing out as soon as I can manufacture some sort of base for it to contain the fire. I’m thinking of passing round the tube of food-grade sealant to others in need of such a repair… we have a whole pack and used just a smidge! Apparently sealant doesn’t work if the joint around the bottom goes as that part gets too hot and there are other solutions for that. How exciting to have a giant one… perhaps some sort of ventilated fire pit might work with it? Set the volunteers the task of working it out! What a great story 🙂 Love it when companies actually take some pride in their product and promote repair instead of repurchase. It does seem to be rare – we should certainly celebrate them!